My book for June is going to be Dissolution by C. J. Sansom. I do have a photo but it refuses to be any way up other than upside down so I will play with that when I get the chance! Despite spending quite a lot of my time on trains commuting, I haven't read that much this month. I think it's because I've been doing a lot of knitting instead. My book for May was Shoes for Anthony by Emma Kennedy. I enjoyed this book right from the beginning and I found myself reading it in a Welsh accent. Normally when I read a book set in an area with a specific accent my internal accent doesn't change, but I found it did with this book which only enhanced the dialogue and language used. 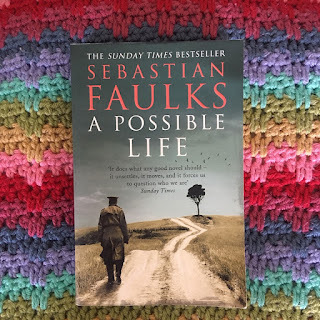 It's a great story, following the residents of a small Welsh village during the Second World War when the Americans are coming and the war affects their daily lives. There was a good dramatic ending which kept me reading and I've since been recommending this to everyone! Gone Girl by Gillian Flynn seemed to be all over the internet last year and my mum passed on her copy to me. Nick and Amy have been married for five years and Amy goes missing on their wedding anniversary. I really can't say much else without giving away spoilers! It's a good thriller, with lots of twists and turns and whilst I can't say I found much of it believable, I think that's kind of the point. Our Tragic Universe by Scarlett Thomas was an impulsive choice from the library. I took it off the shelf to read the blurb and noticed how the edges of the pages look distressed and damaged, which fits with the story of the book as a whole. It definitely had my interest. Meg is an author who is trying to write her 'proper' novel whilst earning money writing formulaic books for young adults as well as reviews for the local paper. One such review is for a scientific (sort of) book which promises people can (will? do?) live forever. Over the course of a few weeks, various things happen to/with Meg as she asks lots of questions about the universe, ranging from fairies to magic to storyless stories to knitting patterns (especially socks which I found quite interesting!). I'm not sure I entirely understood what the book was getting at (if it was even getting at anything) but I did enjoy it. Although I think that is enough Scarlett Thomas for me for a while! Our Tragic Universe wasn't 'choppy' exactly but I did need to be in the right mood to read it. I do admit that I preferred 'Going Out' though. Loving Dissolution! I really liked Dissolution and the next few Shardlake novels, although the last couple of got a bit over-long for my tastes. Hope you enjoy it! I have read Gone Girl and although I found the idea behind the book interesting, I couldn't sympathise with either of the main characters which spoiled the book for me. Ben Affleck plays Nick in the film of Gone Girl and I like him so maybe he will help me like Nick! The main characters were rather unlikeable at times!